We Took the Road Less Traveled: Almost Wordless Wednesday and Another Germany Update! Almost Wordless Wednesday and Another Germany Update! 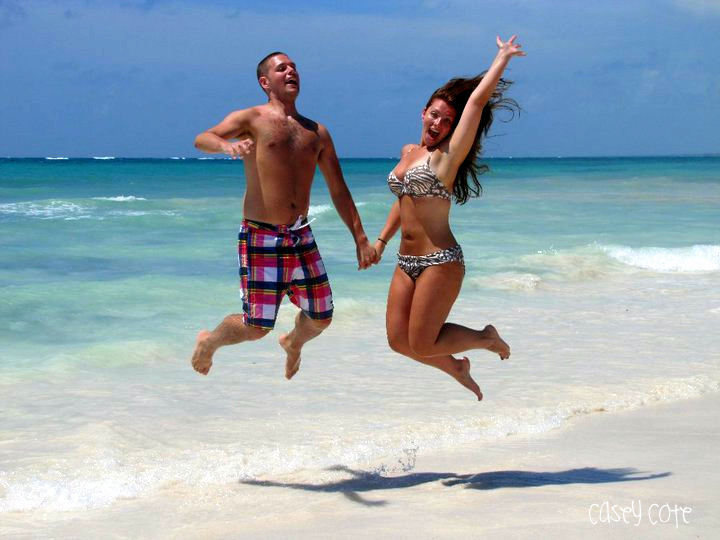 I wish I was back in Mexico with the hubs doing this. So much more fun and relaxing than life these days. Now for a little update on our progress (or lack thereof) on the big move to Germany. Remember in a previous post I alluded to my fear that Murphy's Law was sure to set in soon because things for this PCS were going too smoothly? Well, I totally called it. When it rains, it pours! We literally have been waiting 3 weeks for Force Health to clear D for Germany. It's quite unbelievable how long this has taken. I realize it is peak PCS season, but honestly, when someone tells you something will be ready in a 7 day window and it ends up taking 3 times longer...you start to get a bit frustrated and ready to slap email people. A week ago, we thought we were almost done and ready to submit paperwork to finally get our orders. Then we get an email saying D's records are stuck in Optometry because we need a "note" from his receiving doctor in Germany saying they will continue his PRK eye care there (D got PRK back in February right after he returned from his deployment...it was a big, huge blessing, but we had no idea it would prolong this process.) We both were like "WHAT?!" Neither of us knew where we were going to be resting our heads at night, more or less where we were going to get continued medical care! What makes things worse is that they gave us no direction on how to go about obtaining this continued care form. They weren't even 100% sure what it looked like, they just "knew" they needed it to continue clearing D.
SO FRUSTRATING!!! Finally, D contacted his eye surgeon and the surgeon contacted his buddy in Germany and got things squared away for D. I am so thankful his doctor (who is a Major, mind you, and shouldn't have to go on a man hunt for a form even HE has never heard of for someone he barely knows from Adam! )...what an incredibly nice and helpful man. He will be getting a Christmas card from us this year! Anywho, the infamous continued care form is in and D picked up his packet today to drop off at Outbound so they can start the process of getting our official orders!! (And all the people exclaimed, HALLELUJAH!!) In 3-5 business days, we should have them in our hands, God-willing. After we get them, we've got to high tail it to TMO and set up our pack out dates! I am stressed to the max about this part of the process because with it being prime PCS season, they are requiring a 3 week notice. That 3 week notice, for us, should be turned in by Friday...but that definitely isn't going to happen...and it's totally not our fault. We've been talking with TMO, letting them know of our plans and how we might not make their 3 week requirement. They pretty much told us "Yeah, you and every other PCSer this May." Awesome. Not sure what that means for us, but we've GOT to be packed up and out of our house by the end of the month. No if's, and's, or but's about it. Like I said, still not our fault. It's really disheartening to know that even though the military needs you to do this, this, and this to get somewhere by a certain date, they are totally unwilling to help you get it done. Makes absolutely no sense to me. Seriously, if D and I could do it all ourselves and had free rein to obtain forms and files and could sign off on our own everything, I would totally do it! Sadly, we can't, so we need help...for heaven's sake. You made the rules, my dear Air Force. You can't expect us to do things in a timely manner if your men and women can't provide direction and support. I think I'll get off my soapbox now. I feel better. Thanks for listening. Meanwhile, D also got a polygraph test done (which he needed for his new job) and said it was the worst experience of his life. So nerve wracking and he hopes he never has to go through that again.We also applied for my no-fee passport which hopefully will be here before we start our en-route leave. They told us it would take up to 7 weeks to get the passport (I already had my travel passport, this is for the SOFA stamp to live in Germany for those who are confused). We had a scheduled appointment to do this well within that 7 week window, but we got rescheduled for an appointment 2 weeks later because the agent decided to go on leave. *Eye roll* Alas, again, not our fault that things aren't being done in a timely manner. I am going to have a positive attitude about this and say it will be here in time. I'm sending out good vibes as we speak! In attempt to move forward while waiting for the rest of the world to chip in, we checked a few other non-time sensitive things off our list. In another side note completely unrelated to Germany, in the midst of a rough week of hunting down this continued care form, D got a phone call at work that he wasn't supposed to get. He was informed that his co-worker, dear friend, and mentor had been one of the 8 airmen killed in the Kabul airport shooting. His co-worker was the first person he actually knew and had a relationship with who had died in this war. This hit way too close to home. D's co-worker made the ultimate sacrifice and I will be forever grateful to him and his service to our country. Keep the families of those affected by this random act of violence in your prayers. I can't imagine what they are going through at this moment. Please continue to pray for our all of our troops, no matter if they are here or at war.... especially with the recent news of Osama Bin Laden's death (which I won't post about because my feelings on this are all over the place). I fear this war is far from over.